A painting that asks a question about the viewer’s relationship with God, the painting looks simple until you take a closer look. You see things are different, the painting begins to talk about life’s journey. 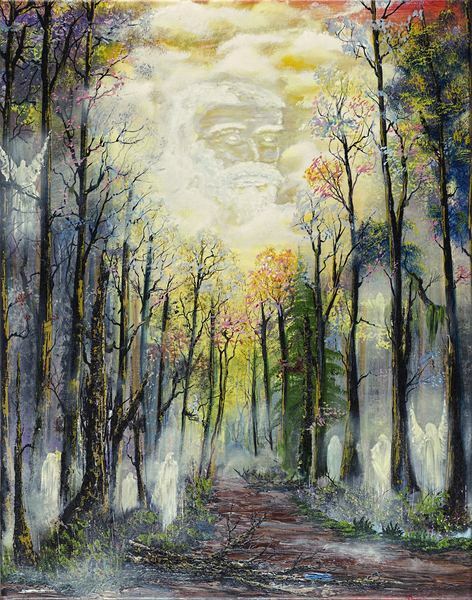 From the artist, Michael Thompson says “life is a journey so the painting starts out in the wilderness, through life you never know what is around you in the painting you see heavenly beings, Angels. there is a road in the middle of the picture the bible says to heaven the road is straight and narrow, notice two trees are lying in the road, throughout life, we must overcome these obstacles.